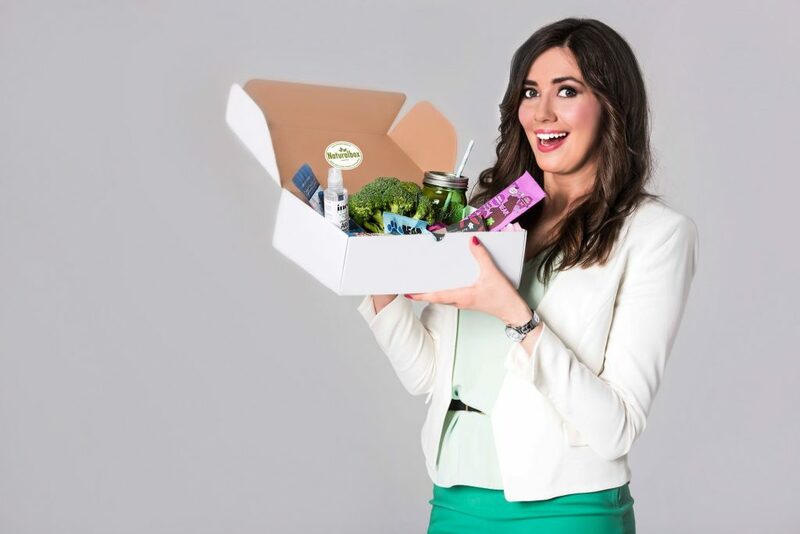 Our company Naturalbox.com is the first subscription service with organic snacks and health and beauty products delivered to people’s homes every month. The idea is to inspire consumers to discover new organic and eco-friendly products for their daily lives and later help them continue their shopping at our online store Ecoliving.se. The idea of crowdfunding was first completely new to us but after some consideration we thought that, in today’s modern world, involving our customers, suppliers and fans – people with a passion for organic food and healthy lifestyle – would be a great way of raising capital. We decided to do our crowdfunding in our home base of Stockholm and went live on Fundedbyme.com. When you decide on crowdfunding it’s crucial to have an effective and interesting way of communicating your product and your vision to the potential investors. At first, we only found some old-school marketing tools that just didn’t do the trick. Since our company is mainly based on social media marketing and communication, we wanted to continue being innovative and looking fresh. Enter Prowly.com – an online media tool for communication, PR, and brand building. We were very pleasantly surprised to learn that it allows to combine your storytelling with other content in what the company calls a ‘Brand Journal’ and embed social media features into it. On top of that, Prowly combines a very simple set-up, design and publishing process with a good deal of guidance and tuition in how to optimize your content’s appeal to your target audience. Although we came across Prowly by chance, we instantly knew this was what we needed to focus our brand message and effectively get the word out both about our product and the investment opportunity! Choosing crowdfunding over a traditional VC doesn’t mean it is less work. It’s rather the opposite. All communication has to be very genuine and engaging in order to touch people’s hearts and minds. It involves a lot of planning and preparation as well as constant communicating with the media. This is also where Prowly proved its worth. The ‘Media Pitch’ function made it easier for us to organize and manage all our contacts, and its advanced features allowed us to better understand our audience and help pitch to them more effectively. Before we went live with our crowdfunding, we built a highly efficient PR and media room and created our ‘Brand Journal’ full of stories and news articles to make ourselves visible to the community. We started collecting our leads and contacts and imported them into Prowly to send out a short teaser that our company would shortly raise funding through an online crowdfunding campaign at Fundedbyme.com. Prowly also allowed us to send selected stories from our ‘Brand Journal’ to a specific group of people using the category function of the email database. Now, when our company has traction, profitability and happy customers, it’s time for us to scale our services in all Nordic countries. Our vision is to become a synonym of “Whole Foods” online. Journalists and investors found it really easy and convenient to find all the latest information, the uploaded press images, and all our social media channels embedded. We even received feedback that people were going to our PR and media room just to hang out to see what’s going on in our company. Successful crowdfunding requires a great media presence using all the social media tools to effectively communicate the company message to help the angel investors better relate to the brand and get to know the founders. It’s not only about producing numbers and statistics, but instead, presenting the management team that is going to execute the business plan. We are really happy and satisfied that we managed to communicate our story with such success and increase the awareness about our brand. We saw a nearly 70 % spike in traffic to our media room during the period. 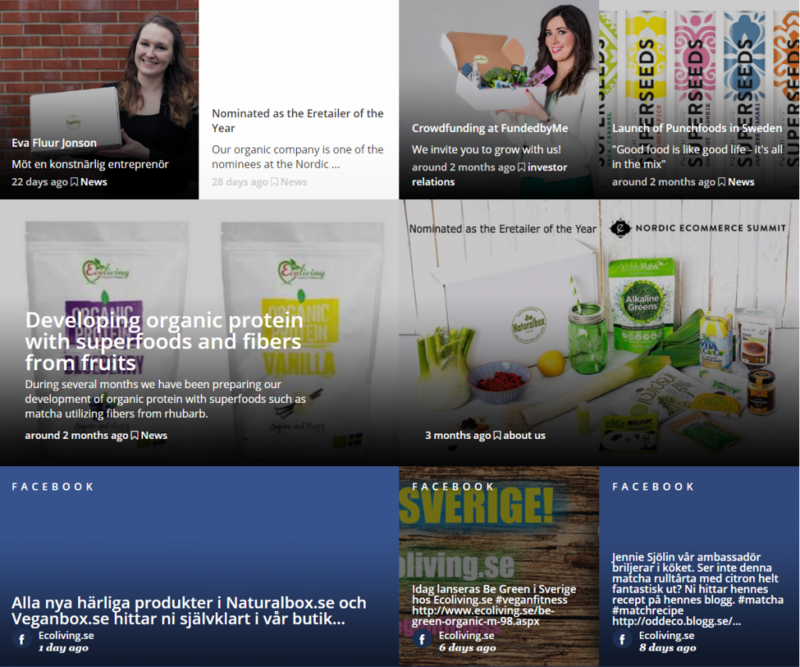 What is interesting is that we also noticed that many customers in our regular online store Ecoliving.se come directly from the media room, which is a testament to the fact that it’s a great way to attract attention and provide relevant content and education that later translates into sales. 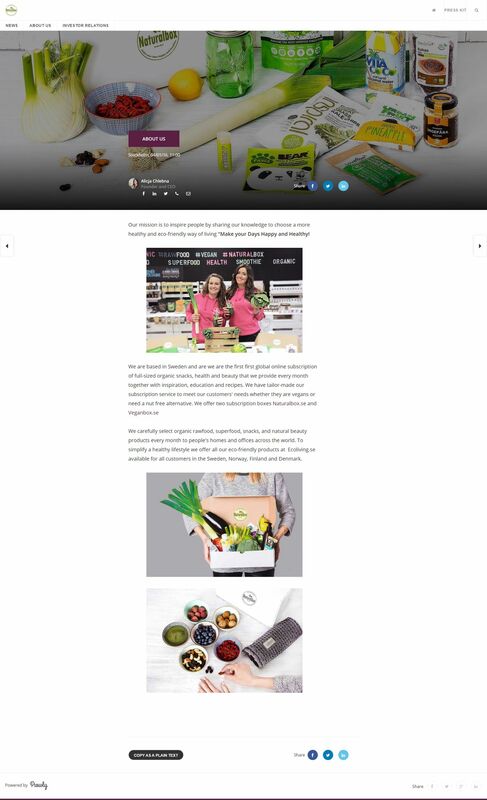 Our crowdfunding at Fundedbyme.com exceeded all our expectations, and we became overfunded in only ten days with Naturalbox & Veganbox Ecoliving International AB being recognized in several important media and newspapers in Scandinavia such as Dagens Industri, E-handel.se, Netthandel.no and Dagens Handel. Once we launched our crowdfunding, we were contacted by several VC firms, but we decided to turn them down. Working with an engaged community of crowd investors who share the same vision as we, is so much more fun than an old-fashioned VC. Nearly 100 investors from more than ten different countries have chosen to invest in our crowdfunding campaign that as a result became 212 % overfunded and received important media coverage in key media channels. We are now a global community of shareholders from Scandinavia, Europe, South East Asia, Middle East and North America with an interest in an organic lifestyle. This is the power of global crowdfunding in comparison to VC funding. Now, we have engaged our friends all over the world who are willing to be ambassadors for our company and open important doors for our further growth. Funding your company is not only about capital, it’s about a network of individuals who are engaged and willing to bring value to the company. Entrepreneurs should focus more on intelligent capital that gives their company leverage and a strong global network. This, in turn, was possible as a result of a very effective media campaign thanks to Prowly’s complete solution for efficient targeted brand communication and media relations.